I probably don’t have any songs on my iPod that were recorded in Muscle Shoals, Alabama. But most Americans will recognize — and like — just about every song featured in the documentary from first-time-director and Boulder resident Greg ‘Freddy’ Camalier. Though nobody seems to be able to put their finger on what exactly the “Muscle Shoals sound” is (it was described to Aretha Franklin as “greazy”) here are some examples: Mustang Sally, Land of a Thousand Dances (think: Naaaaaaa, na na na naaa), I’ll Take You There, When a Man Loves a Woman, and Brown Sugar. Well-liked songs are fine, but they don’t necessarily make for a good documentary. That’s where Camalier comes in. He opens with interviews of legendary singers, including with Bono, Keith Richards, and Mick Jagger, talking about the magic of the Alabama studio. And as a storyteller, he knows how to frame and group anecdotes into something that feels like a coherent whole. Although we try to update this page every day, please check with your theater directly for the very latest information. 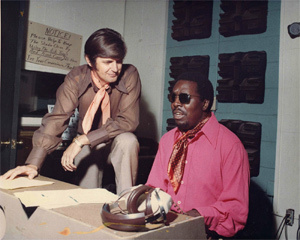 Rick Hall was born in a rural house in rural Alabama. The floor was dirt. There was no running water, no indoor toilet, and practically no neighbors. He did learn to play music, and vowed to make something of himself. As a young man he had early success producing a recording but didn’t pursue music seriously. After his wife died in an accident, and after scraping bottom, he decided to focus on writing and producing music again. He came back to the studio and lightning struck again. His first recording was a hit: When a Man Loves a Woman by a local singer named Percy Sledge. Hall found a solid rhythm section known as The Swampers (David Hood, Jimmy Johnson, Barry Beckett and Roger Hawkins). Since they played behind some of the best soul music of the era, people were often surprised to discover they are all white. Camalier detours a little into the culture of the time. In the studio, the artists may have been color blind, but outside, it was still the deep South. Muscle Shoals sticks with Hall as he meets Jerry Wexler, a famous producer with Atlantic Records, and through the end of their professional relationship, which saw the Swampers leave Hall to form their own recording studio across town. Camalier doesn’t drive a wedge between the two factions; instead he blurs the lines of their success, focusing more on the “Muscle Shoals” sound, and the success that both sides of town enjoyed. The musical history lesson is deep and detailed in the early days — the ’60s and early ’70s. It gets shallower as the years progress, finishing with mere mentions of later successes (including the one album I actually have on my iPod — Communiqué by Dire Straits, recorded in 1978, and not in Alabama). Camalier has some good historical footage — but not much of it. He augments it with well-produced, modern interviews of artists like Percy Sledge, Aretha Franklin, and Greg Allman. He includes footage of the modern-day rural locations — the Tennessee River, which Native Americans once called the Singing River; fields of sunflowers; pastures with cattle and horses; and untamed forests dwarfing country roads. The Alabama producers are interviewed where they live, often on a comfortable armchair strangely placed in an abandoned building or out on a dock. The number of interviews and settings is more work than a lot of first-time filmmakers are willing to do, and it’s enough to make Muscle Shoals look polished and feel well produced. There were only a couple of brief moments when I wondered whether Camalier had anything more to say, but he always picked up the pace again and told more stories. Muscle Shoals doesn’t really drag, even at nearly 2 hours. The only time I felt like the film was really pushing its luck was when it closed with Sweet Home Alabama. Lynyrd Skynrd had worked with one of the producers, and there is a lyric in the song: “Muscle Shoals has got the Swampers,” but Camalier pointedly doesn’t reveal that the song was recorded in Georgia. One of the best things someone can say about a documentary is “I didn’t know or care much about the subject, but I still liked the movie.” For me, although I don’t know that I’ll be buying any of these songs for my iPod, I didn’t mind hearing them again and seeing where they came from.